Stupa Guesthouse i Kathmandu, Nepal: Bestill nå! The following group types are not accepted by this hostel: Junior / Primary School, High / Secondary School, Stag/Hen/Bachelor Party, Sports Group, Cultural Group If you have misrepresented the type of group you are booking for, your booking may be cancelled by the hostel." Stupa is conveniently located and is walking distance to the Royal Palace Museum, Bhagwati Bahal Durbar, the Garden of Dreams, Basantapur Durbar Square and Monkey Temple. Or wander through the streets of Thamel to find exquisite teak carvings, hand-hammered Tibetan singing bowls, mountain tea blends, fragrant incense, hand-knitted sweaters, or elaborate Khukari knives. We are proud that for last 3 years we have made our guests feel like they are staying at home with our warm and friendly hospitality. We assure you for the clean, safe and free from traffic noise accommodation. 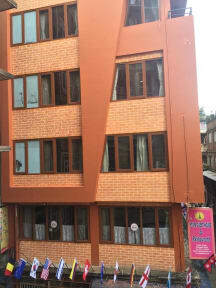 Stupa Guesthouse has 17 comfortable neat and clean rooms with facilities, offering Standard, Deluxe and Budget rooms. 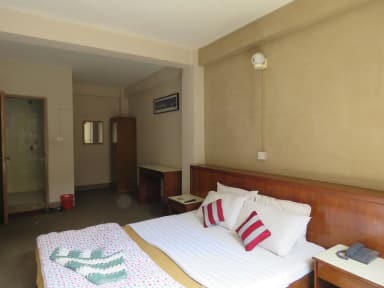 Some of our rooms comes with private bathroom with hot shower and cold shower all the time and Some of the rooms comes with shared bathroom with hot and cold shower TV in every rooms and providing free Wi-Fi internet services in all the rooms. Stupa is a family running guesthouse . We will be ready 24 hrs to provide you the services or assistance you need. 1. Check in from 5 am and check out until 12 noon.